First Thoughts When I got this in the post, you can surely say that I was FREAKING OUT. Amy is one of my favourite authors and her Die For Me series is still one of my epic loves. If you haven't read it, go check out my reviews for them and go get it! You won't regret it - I swear. So upon reading a little and book stalking Dreamfall online, I really got into the sound of it. Recently, when it came to the top of my TBR, I was more than excited to start it. 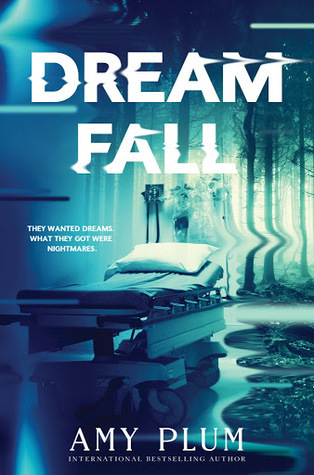 Review Dreamfall is the first in a new duology by the amazing Amy Plum. I've always been significantly intrigued by dreams and nightmares and the whole lucidness of remembering them, controlling them and knowing what dreams and nightmares actually mean, so Dreamfall ultimately sounded like it was going to gel with me completely. Cata is our predominant narrator, a sixteen year old girl with severe insomnia and other forms of mental anxieties (but we also meet Fergus and other patients soon). She suffers greatly with nightmares and it's noticeably distressing for her and reading about it, as I also suffer with severe insomnia and anxiety disorders, with occasional nightmares: but Cata and the other teens are very different to just your typical sleep disorders. They want out of it - and so they move to a clinic where experimental doctors confine that they have a cure. First, the teens are hooked up to these weird things that I would run from, and they begin their cure - but it goes terribly wrong, and suddenly their worst fear comes true and they are stuck in the nightmares, completely helpless. Without a way out, they have to face their deepest and darkest fears and things that have scared them for this long, to find a way to return to their reality. I was expecting something completely different when I started Dreamfall - something much more Die For Me, but I was surprised by a twist in this different tale. The characters are intricate and very well written and Cata and the other characters were written on point. While I didn't love it as much as I was hoping to, it was still a fierce horror with science fiction aspects that made this a genre I couldn't put my finger on - something unique and almost life-like. I totally believed the genuine terror of the characters, and Amy (queen of YA Fantasy romance?) wrote a little something between Cata and Fergus that I'm hoping to see more of in the next book. Overall, Dreamfall is a series I'll definitely be continuing. I was on the edge of my seat at the cliffhanger so I'm desperate to read the next instalment! If you love intrigue, steady pace and a plot to make you keep a night-light on, this is your next read. Huge love for this. Perfect For YA Horror fans.